For its 20th anniversary edition, the Festival is seeking to explore new directions and continue our exploration of play. 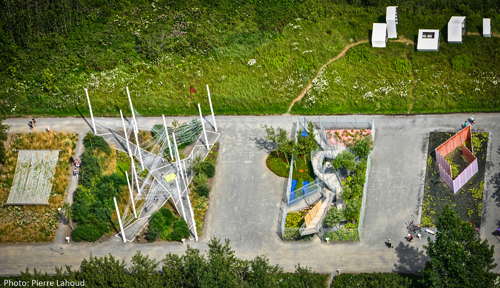 “Terrains de jeu” is fertile ground for creativity, encompassing both the notion of compact space and play. The Festival is encouraging designers to imagine spaces that work within the confines of modest parcels all the while offering a big punch. Confronting the planetary challenges of needing to limit growth, developing sustainably and minimizing our ecological impact, the 2019 Festival is a venue where designers will explore the principals of voluntary simplicity all the while offering a footprint for fun. The interactive spaces chosen through this competition will excite, enthral or envelop visitors. They will be child-friendly without being childish, adventurous without being unsafe. Explore, experiment and celebrate – this is the effect we want the 2019 Festival to have on every one of our 60,000 visitors. Applicants are limited to one proposal, either as individuals or multidisciplinary team. The Festival encourages participants to form multidisciplinary teams to include a landscape architect, architect, artist, designer, engineer, horticulturist, botanist, teacher, scientist, etc. The objective is to favour an approach that encompasses various design disciplines and expertise from various quarters. For the 20th edition of the Festival, we will be launching a parallel program for young designers in their twenties (‘la vingtaine’) to curate and create a series of experimental landscapes that will be built and developed over the summer months as part of a creative camp. This competition will also be open to students studying in design, environment or other fields. Details on this initiative will be distributed in November.